Thank you to everyone who has helped. Any errors are entirely my responsibility. Corrections welcome. 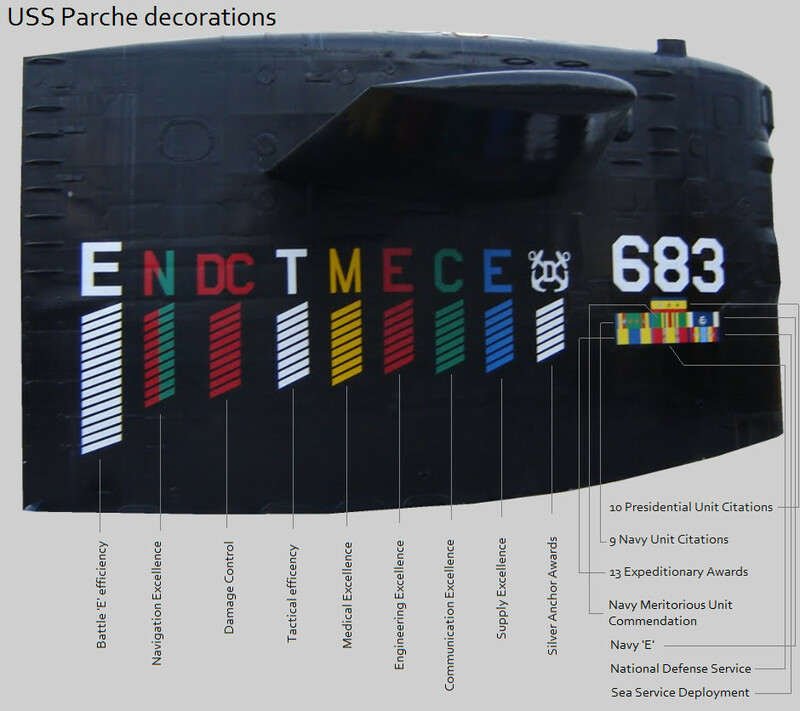 When she was finally decommissioned in 2004, after 31 years and 19 deployments, USS Parche was the most decorated submarine in US Navy history. 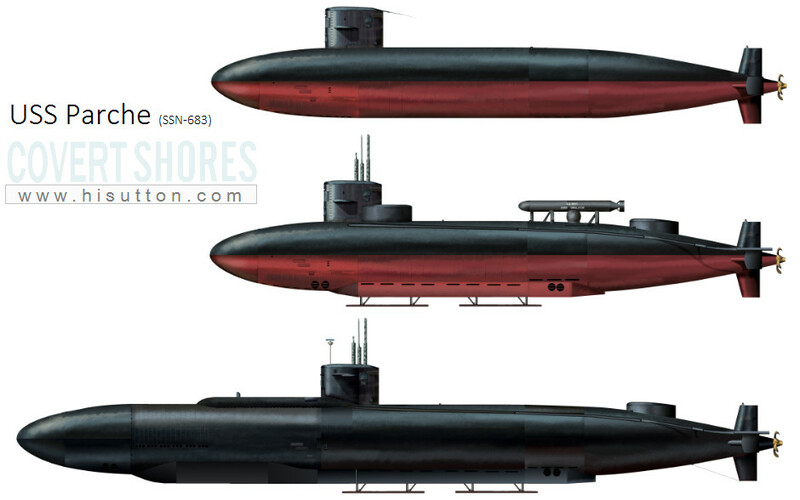 SSN-683 Parche (pronounced Par-chee) was built as a Sturgeon Class attack submarine but was modified over the years, becoming a spy-submarine par-excellence. 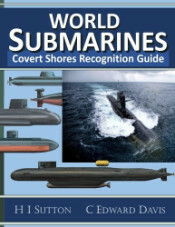 Despite details still being classified, it is treated as fact that Parche conducted covert intelligence operations in the proximity of the Soviet Union during the Cold War, and other countries of interest in the years since. Most of the modifications were hidden below the waterline but the diver’s chamber, taken from the retired USS Halibut, was attached over the aft escape trunk. Known as ‘the can’ this was disguised as a DSRV (deep sea rescue vehicle) simulator exactly as on Halibut. Below the waterline a skirt was added with retractable skegs per USS Seawolf. Side thusters were added in the lower ballast tanks to enable her to hover and position herself exactly on the seafloor. 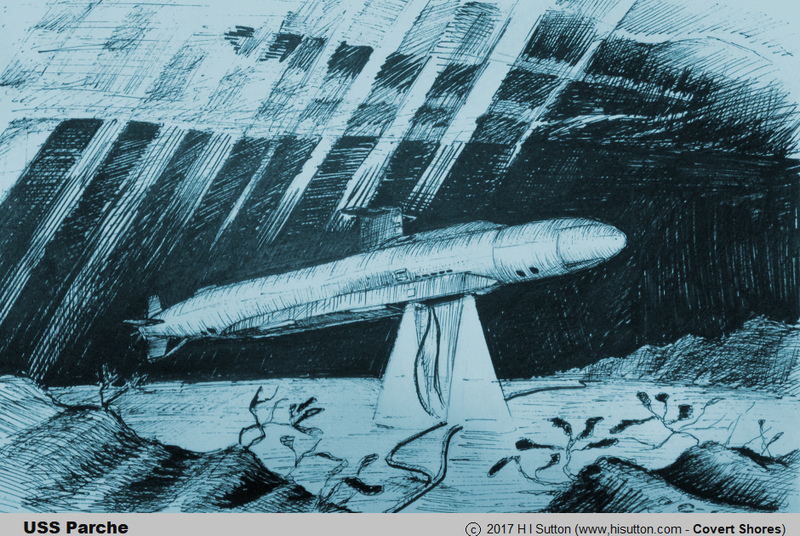 Small ‘Sonar fish’ could be deployed through the torpedo tubes, and there was possibly an external locker for submarine communications cable (SCC) taps. This was most likely Parche’s primary espionage mission, laying and retrieving wire taps on Soviet communications cables in the Sea of Okhotsk in the Pacific and Barents Sea and White Sea on the Atlantic side. Another visible modification was soon added. A bustle behind the sail contained mixed gas for the divers to breath. Because a similar bustle had previously been added to USS RB Russell containing a communications buoy, this bustle as often misidentified as such. In fact the bustle on RB Russell was also given over the special Mission equipment, likely the diver’s gas. The most extensive modification saw her hull extended by 100ft (30m) ahead of the sail. It took 4 years, reportedly due to the discovery of some faulty welds. Consequently when she emerged in 1990 she was almost too late for the Cold War. She was still relevant to the post-Cold War world and earned another three Presidential Unit Citations before retiring in 2004. 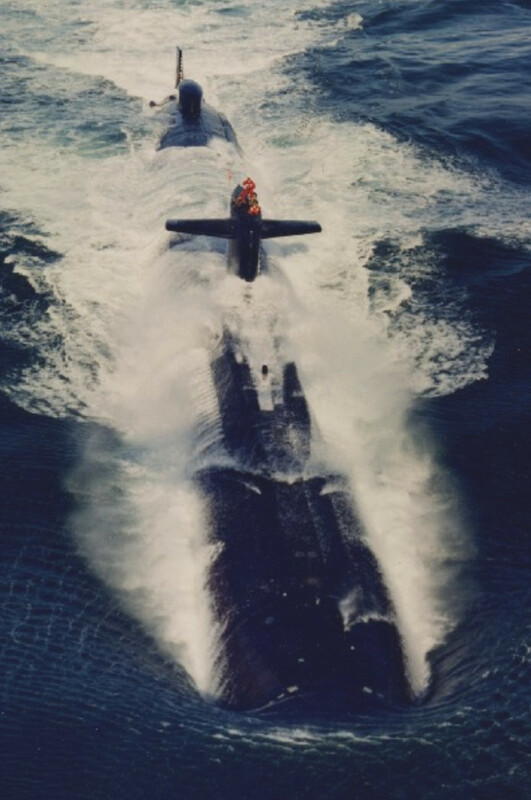 The hull extension was arranged similarly to the USS Seawolf (SSN-575). 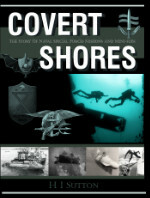 It was of double-hull construction leaving room for large ballast tanks and space for the diver’s mixed breathing gas. Inside the hull was a separate pressure cylinder (like a hyperbaric chamber) for compression and decompression of the saturation divers. 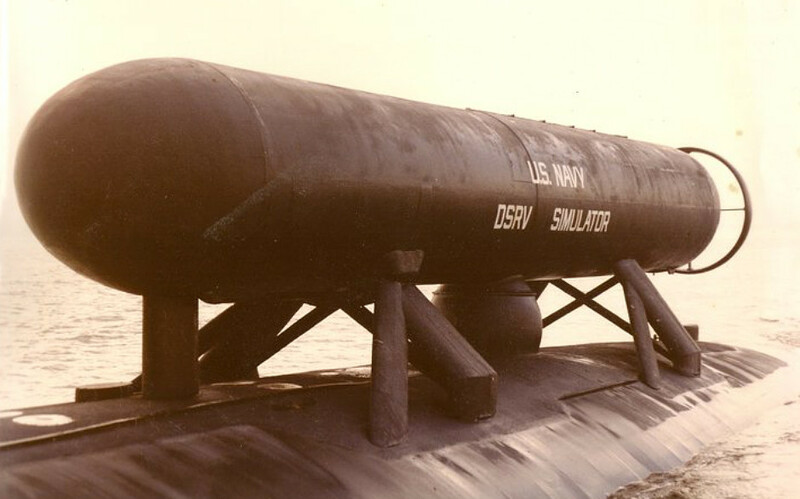 The inclusion of the chamber inside the hull allowed the fake DSRV chamber to be discarded, and the carriage of the diver’s gas in the otter hull allowed the bustle to be removed also. The chamber was placed slightly to port (left) in the lower hull with the access hatch in the starboard side and moon pool’ exit hatch in the bottom, going out through the submarine’s main pressure hull. The diver’s chamber would have consisted of at least two, probably three, chambers. Their living space with bunks and basic amenities, an access trunk and the diving compartment with the moon pool in it. The long umbilical hoses and wires which connected them to the host submarine where stored in the diving compartment. In front of the diver’s chamber was a sloping ‘aquarium’ for the Variable Depth Sonar, known as ‘sonar fish’. 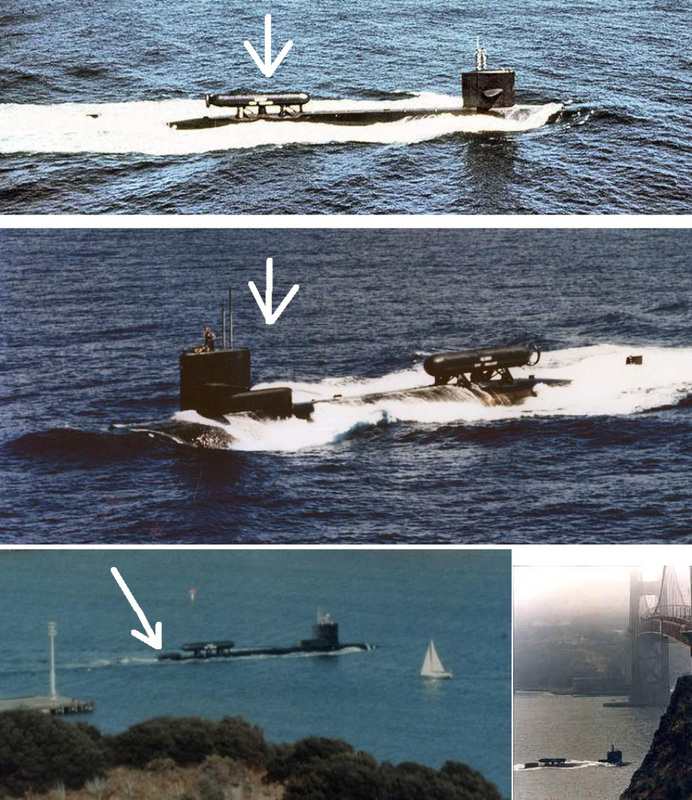 The arrangement was likely similar to USS Halibut and Seawolf with a trench in the bottom and a hangar-live workshop (‘bat cave’) taking up both decks. Approximately four VDS could be carried, and ROVs (remote operated vehicles) could also be deployed through the aquarium. Ahead of the hull extension the living spaces were likely rearranged. It is rumored that most of the crew were not permitted to access the special mission spaces while they were in use (thus helping preserve its secrets, not knowing is a matter of pride for many former crewmen), which suggests that the crew berthing originally in the bow was instead used by the ‘spooks’ and other special mission crew. This suggests that some of the hull extension, presumably above the diver’s chamber, was used for regular crew accommodation. The modifications impacted control authority, particularly in diving and climbing. So her sail was also modified with the hydroplanes enlarged and repositioned higher up (to allow them to still rotate) in an effort to improve control response. Apparently she still handled poorly when not using her thrusters. Today the sail of USS Parche is on display in Bremerton, Washington.